For 2013, Nevada scored a 0.82 on the FRASE index. By design, the FRASE index for the United States overall in any year will equal 1, so a score of 0.82 indicates that the impact of federal regulation on Nevada’s industries was almost 20 percent lower than the impact on the nation overall. 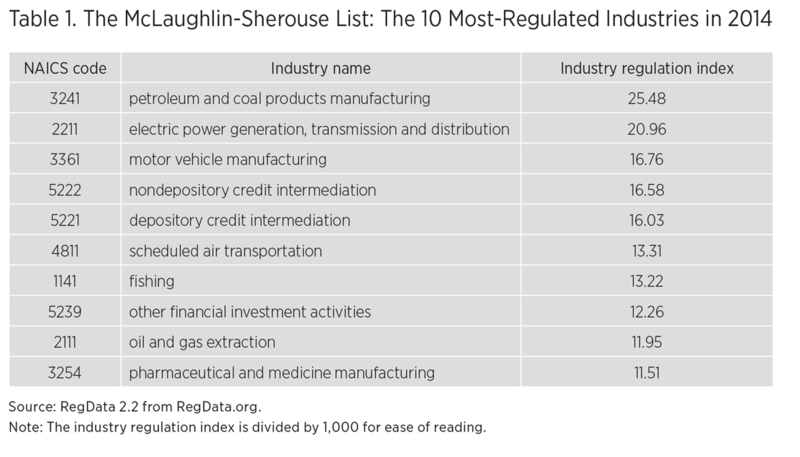 While there is some fluctuation from year to year in the ratio of the impact of federal regulation on the state to its impact on the nation, more dramatic growth occurs in the total number of such regulatory restrictions affecting the state since 1997. One way to measure this impact is to scale the weighted restrictions to the total weighted restrictions for the national economy in 1997. Doing so allows us to calculate the growth of the FRASE index relative to 1997. For Nevada, the FRASE index, scaled by total weighted restrictions for 1997, has grown by 74 percent from 1997 to 2013. As shown in table A1 in the appendix, this significant growth in the 1997-based FRASE score contrasts with the more modest growth in the current-year FRASE. The constant-basis index diverges from the current-basis version because it takes into account the growth in regulation nationwide over time. For Nevada, therefore, the increasing constant-level basis therefore reflects two upward trends: an increase in overall regulation for the country, and an increase in the Nevada-specific impact of federal regulation. 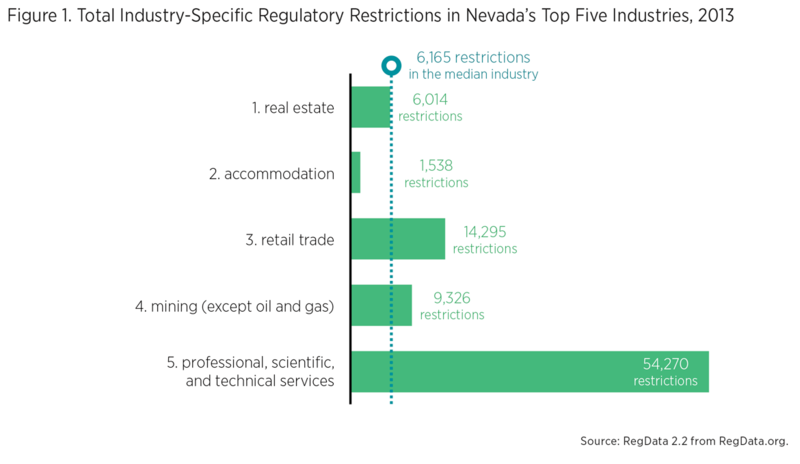 So why is the impact of federal regulation lower for Nevada than for the country overall? The answer lies in the particular industries that make up the state’s economy and how regulated those industries are. The numbers of regulatory restrictions affecting the top five industries by contribution to Nevada’s private sector are shown in figure 1, and the contributions of those industries to the state and national private sector are compared in figure 2. The accommodation industry plays a unique role in Nevada’s economy. In fact, that industry con- tributes a share of Nevada’s private sector more than 13 times the size of the share it contributes to the private sector of the nation as a whole. However, the accommodation industry is only lightly regulated at the federal level (though it is regulated more heavily at the state level); it faces only a quarter of the federal regulations faced by the median industry. 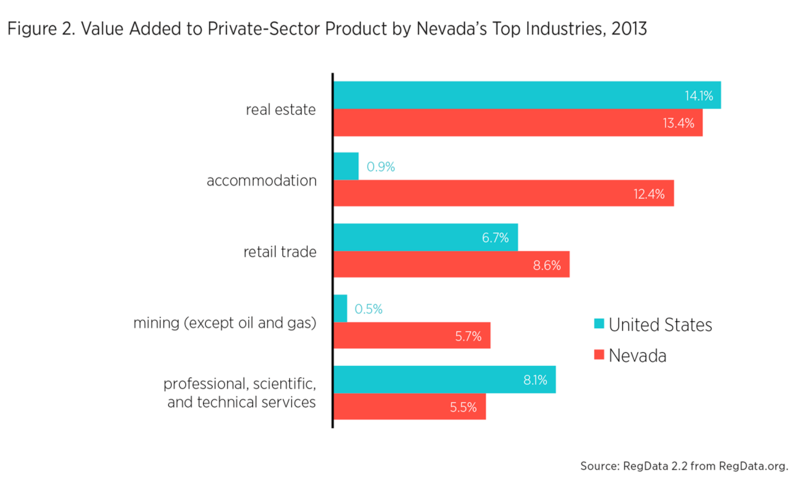 In fact, the industry that contributes the most to Nevada’s FRASE score is only the fourth-largest contributor to the state’s private sector: mining, which does not include oil or gas extraction. Not only is mining more highly regulated than the median industry, subject to over 9,000 restrictions, but it is more than 11 times more important to Nevada’s private sector than to the US private sec- tor as a whole. So who is doing the regulating? 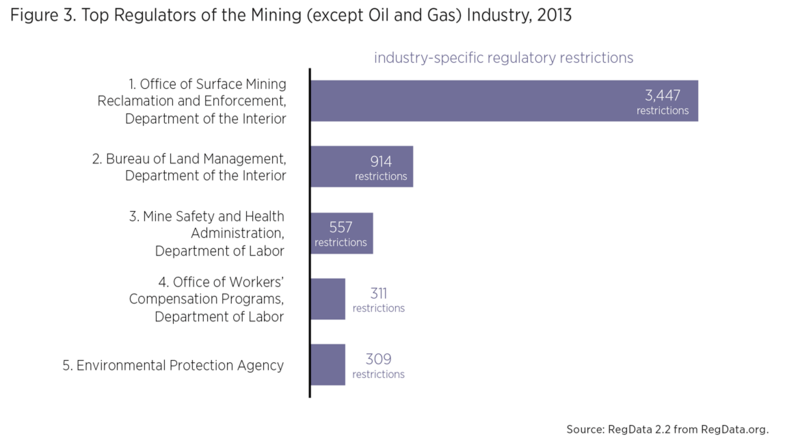 The five agencies responsible for the most industry-specific restrictions are shown in figure 3. The top regulator is the Office of Surface Mining Reclamation and Enforcement. With over 3,400 restrictions, that office accounts for more than a third of all industry-specific restrictions. The other top regulators are the Bureau of Land Management, the Mine Safety and Health Administration, the Office of Workers’ Compensation Programs, and the Environmental Protection Agency.